BANGALORE: With medio Eugeneson Lyngdoh’s smart strike in the 78th minute, Bengaluru FC tasted their first home win in the Hero I-League by defeating Bharat FC 1-0 on Sunday. The Gaffer Ashley Westwood pulled no surprise this time in the Bengaluru starting lineup, with the successful trio of captain Sunil Chhetri, Robin Singh, and Beikhokhei forming the attacking front. For Bharat FC, Rahim Nabi was making debut for his new club. Bharat FC kicked-off from left to right. They could have gone ahead in the very first minute of the match – missed the chance of the season when Bengaluru FC defender Osano’s horrendous pass was collected by Lester Fernandes, which he relayed to striker Kris Bright, but his shot went way outside the target. The Visitors missed another scoring opportunity in 11th minute. 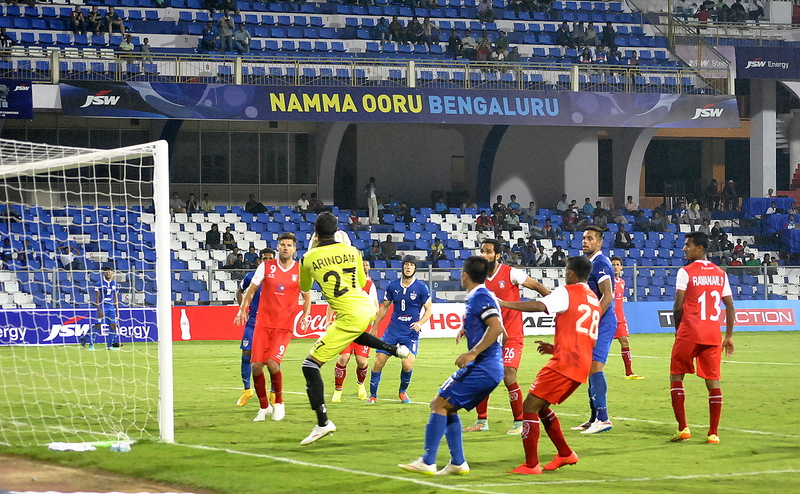 The Bengaluru defense looked jittery often failing to clear the ball. However, captain Chhetri looked in good touch maneuvering from the midfield. In the first half, Bengaluru was controlling the game from the midfield, forcing 5 corners in quick succession. Bharat FC’s defense, led by captain Gourmangi Singh, looked solid and Beninese international Roumald Boco gave stability in the midfield. The Second half started in a positive manner for hosts – Robin Singh failed to follow the ball inside the box, which could have resulted in a goal followed by another one from Eugenson in 58th minute. The most important juncture came when Eugeneson footed the ball from way outside the box, he took time to pick his spot and put the ball back of the net. The match came alive when a solo run from CK Vineeth missed the post by an inch. Bharat FC failed to square up after making several attempts later in the game. Hero of the Match – Eugeneson Lyngdoh.